The winds had built to over 35 knots, with, as we learned later, gusts that hit 60 when the tide in the Georgia Strait turned against it. Almost instantly, our capable, but overwhelmed, 25-foot wooden sharpie yawl was knocked flat on her beam by towering breakers. When it happened again, just moments later, I knew we were in real trouble. After her first two self-rightings, we survived the Georgia Strait summer “southeaster” by raising our centerboard to stop tripping on the breaking swells as she skidded down their faces. Two hours later we made shelter in the lee of Lasquiti Island. I will never forget that harrowing voyage. That experience 15 years ago while sailing from the San Juan Islands to the Broughton Archipelago near the top of Vancouver Island, made it clear that we needed a larger, more weatherly vessel if we were to continue our dream of annual voyaging up the Inside Passage, exploring north, closer to Alaska each summer. After 13 years of enchanted family cruising, we had to replace Raven. Taking a break from sailing up north, we decided to buy an interim boat for exploring the Columbia River. 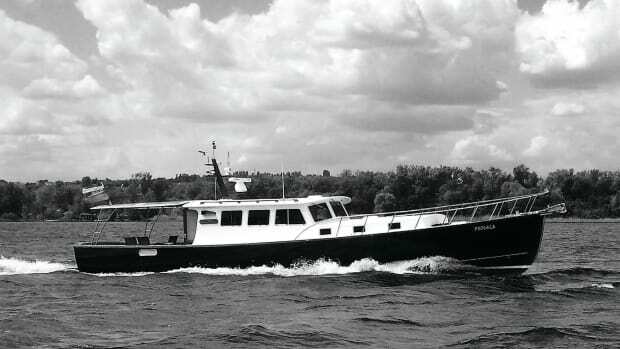 Eventually, we landed on a salty, but fairly tired 33-foot bridgedeck power cruiser designed by Ed Monk Sr. and built in 1946. Royal Scot needed both aesthetic and systems work, but turned out to be a perfect displacement hull with a 4-cylinder diesel, one of those architecturally satisfying Monk interiors, and lifelong ties to the Columbia River where we live. And, with seven safe voyages up the west coast of Vancouver Island under her keel, she was a proven passagemaker. Per our plan, Royal Scot gave us our first opportunity to experiment with using 100-percent biodiesel fuel in her old Perkins engine. It took a lot of my weekend time, but only a modest amount of money to make her safe and shipshape again. 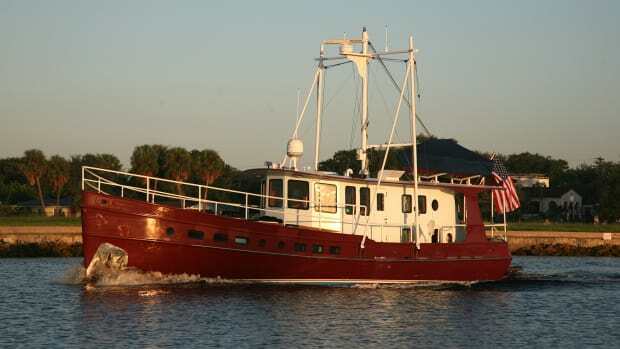 After years of cruising, the author was left dreaming of a custom boat to fit his needs. Over the next three years Royal Scot took us on numerous comfortable voyages up and down the Columbia River, from Astoria to Lewiston, Idaho, and other stunning locations in between, transiting 11 dams and their locks in the process. We learned firsthand about the ease of switching an older vessel to clean and quiet biodiesel, changing the fuel lines to Viton and frequently changing the fuel filters during its first weeks. Over those years we never had any fuel-related issues. Royal Scot was quieter and produced less smoke and odor. Commercial biodiesel often smells like waffles, rather than French fries (as absolutely everyone jokes), both of which are much better than sickening diesel. Our Oregon-made fuel was frequently an interesting conversation-starter. Yet, over time, we longed to be sailing and voyaging north again. We sold her just after celebrating Royal Scot’s 65th birthday. 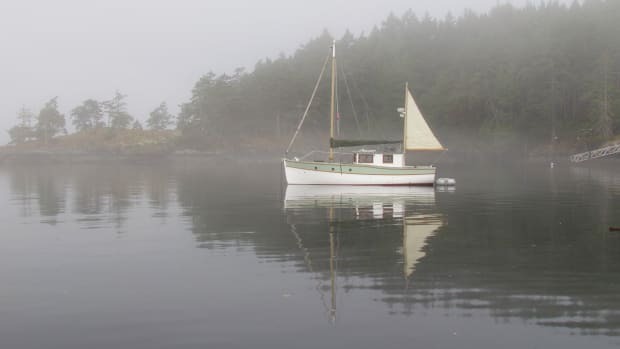 Determined to find a seakindly sailboat with a diesel auxiliary and cozy pilothouse that could handle the bigger weather, tides, currents, and swells of the northern Inside Passage, and certain that we did not want another vintage wooden fixer-upper, we began searching for our next vessel. In spite of their low maintenance, I have long shunned fiberglass for its lack of recyclability, with its insane thousands of years’ long half-life, its inefficient weight, voluminous carbon footprint, and an aesthetic that has never moved me. Furthermore, sturdy and recyclable aluminum boats in our target size were too dear for our budget. Though steel boats are easier to recycle, the ones that we found were either too big or too rusty to tackle. The freshest wooden boat we found that somewhat meshed with our hopes and budget was in good shape, but it was 20 years old and had one of those labyrinthine impractical interiors that looks like a cocktail lounge instead of a real boat. We knew we had to change something about our search. 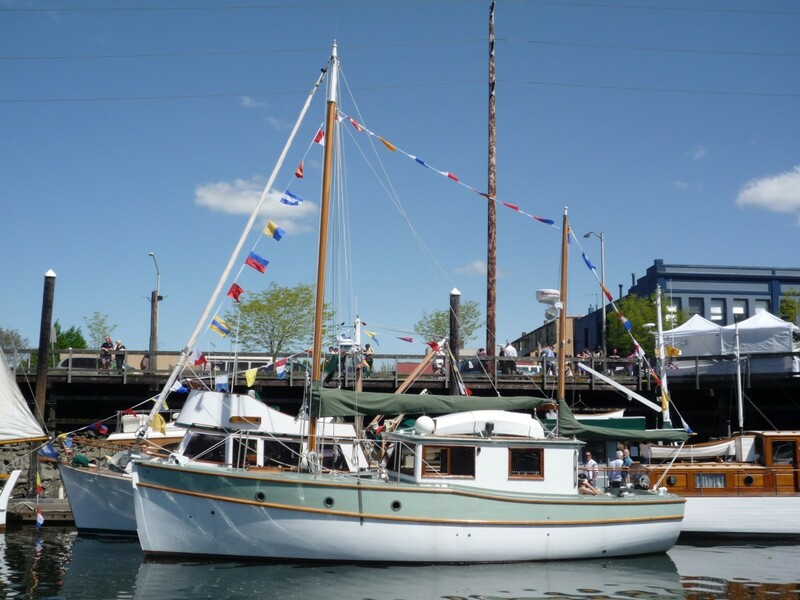 Years later, the completed Ama returned to grace the Wooden Boat Fest. Enticing as the message was, we were sure that an entirely new boat would never fit within our budget. Of course, I had to find out more anyway. With the proceeds from Royal Scot and a tolerable portion of our savings, the deal that the school proposed looked feasible for us. Our unspoken dream of a new, safe, and truly low-impact vessel for the Inside Passage took a tack toward reality. 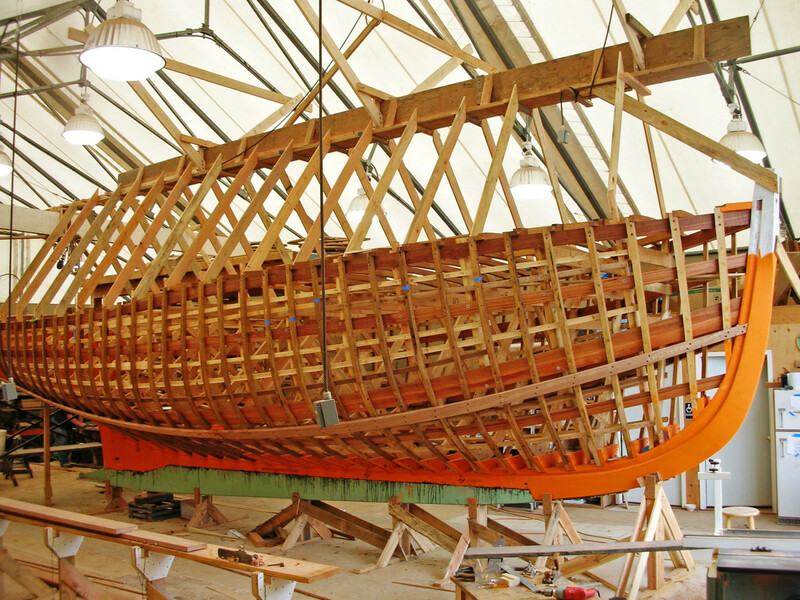 Sitting in its cluster of small-town waterfront buildings a few miles down the bay from Port Townsend, in quiet Port Hadlock, Washington, the Northwest School of Wooden Boatbuilding is the antithesis of the modern industrial boat factory. 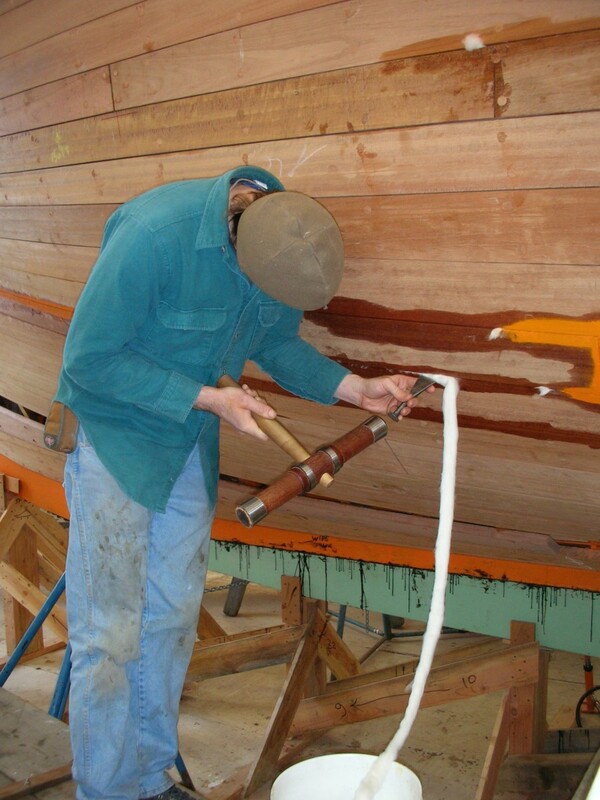 Foundedin 1981 by the legendary Northwest boatbuilder Bob Prothero, the school’s purpose is to ensure that commercial and recreational wooden boatbuilding skills stay alive, and provide good jobs in the Pacific Northwest. 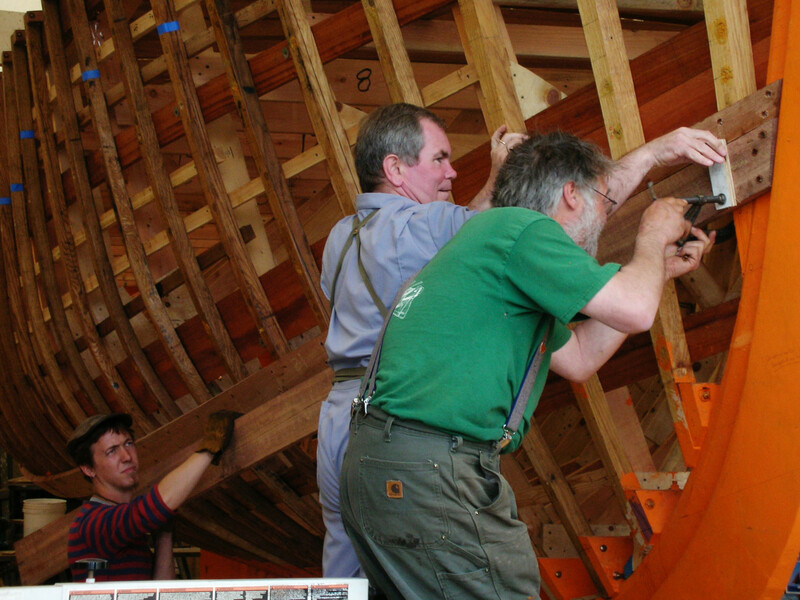 The school builds and restores inspiring vessels, creating superb marine craftspeople in the process. 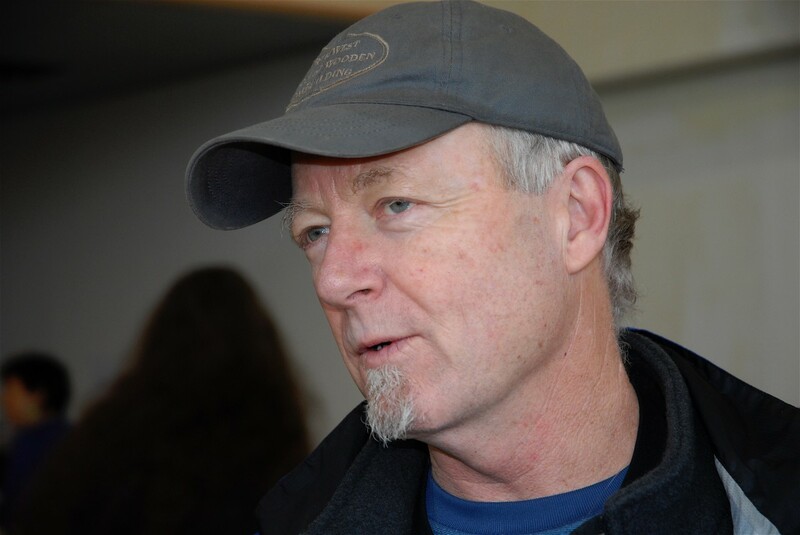 Carl Chamberlain, a skillful marine designer and a part-time instructor at the school, came to play a pivotal role in the design of our new boat. 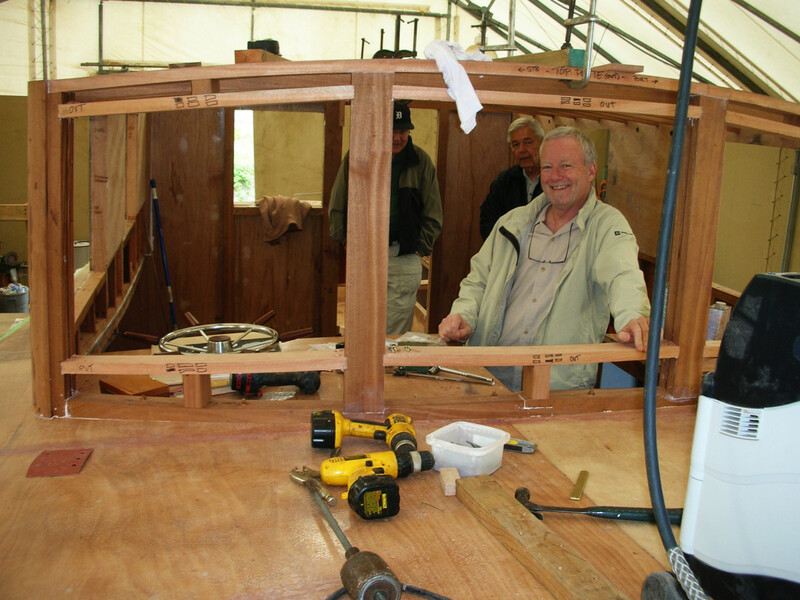 Master shipwright Richard Wilmore and his flotilla of talented and hardworking students-—20 to 22 students each year—built the hull, house, and spars for what would in less than two enchanting years become Ama Natura. Here the structure receives the first outer plankings. Having the opportunity to imagine and oversee the building of my own ideal Inside Passage vessel has been exquisitely educational—initiating a chain of engaging design, building, voyaging, and teaching adventures. This was a perfect gift for a passionate boatbuilder, sailing captain, and clean-water environmentalist like me. From the start, because of the ecological perspective that has filled my head, heart, and work-life since taking an ecology course in college 50 years ago, there was never a question that any boat I had a hand in building would have to reach a very high bar for efficiency and emissions. Beyond these aspirations, I have wanted to demonstrate a path forward to reinvent existing and new boats that can be positive forces for clean water and marine life. Concurrently, those big knockdowns in the Georgia Strait still focused us equally on seaworthiness, seakindliness, and reliability. At its essence, along with everyone who did so much to help us over the next years, I was trying to create the beautiful synthesis of a practical new cruiser and an environmental test platform that could help change boating. 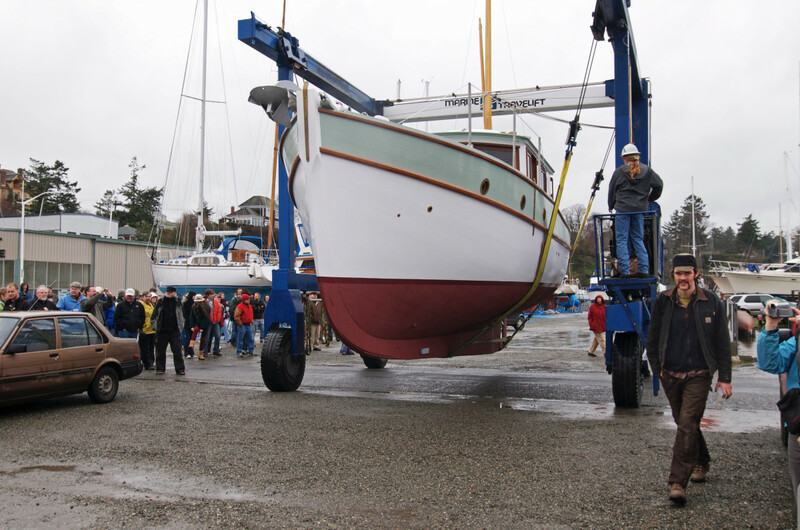 The seaworthy requirement took me straight to a proven Northwest fishboat-inspired displacement hull of 36 feet, which was the maximum length that the school felt able to take on in the two-year time frame allowed. 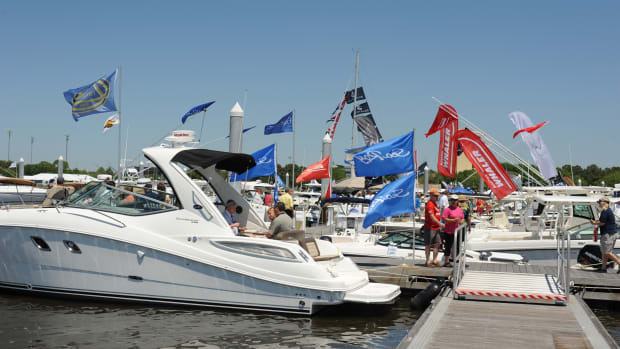 Ama’s environmental considerations also sparked a new body of research into large-boat construction and the subsequent behavioral change that is evolving to this day. Cotton strips are inserted between the planks to water-tight the hull. 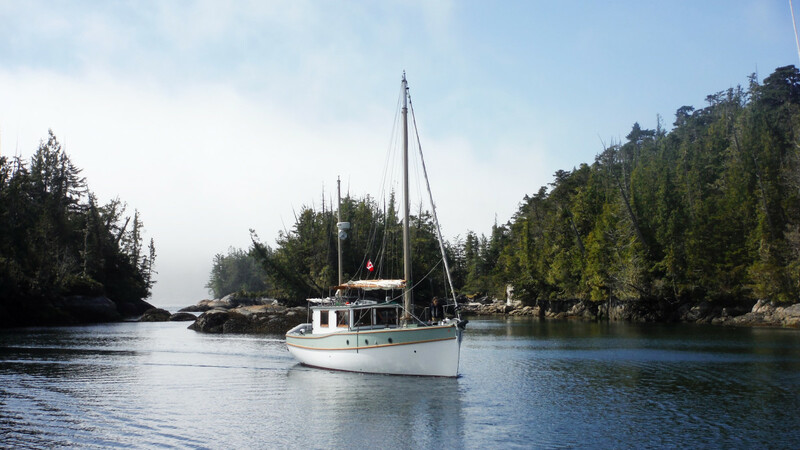 The summer winds in the often narrow and meandering Inside Passage, when not absent entirely, generally follow the glacial channels and are most often directly on a vessel’s bow or stern. Even solid light-wind sailboats end up motoring more than sailing in these waters. Yet a few years solely under power on Royal Scot had left me yearning for sails to set and trim, and the desire for less engine noise and fewer emissions by using the fickle wind whenever practical. We also sought an effective means to dampen the rolling that had become familiar while crossing big Inside Passage straits, sounds, and inlets. I gained most of my sailing and general boating skills on gaff-rigged boats, including a Friendship sloop in Maine, and on our diminutive sharpie yawl, Raven. I know how quickly a low-aspect gaff sail will fall into its lazy jacks, even on the wind with a topping lift. And for sailing in stronger winds, I wanted a sail plan that could go jib and jigger to be balanced without a main in strong winds. Proudly, the author had a heavy hand in her design. Another idea that germinated from those days on the water was a fishboat pilothouse, one with an inside helm, galley, and settee in the same space. My wife and I had already realized that this arrangement suited us better than the more common arrangement with galley and settee forward, below the helm. Plus, we had already reserved that forward and lower area for a cozy space with quarterberths for guests. In that saloon we now have a more secluded place where we enjoy a crackling biodiesel-fueled Dickinson fireplace heater that keeps the core of the boat warm. 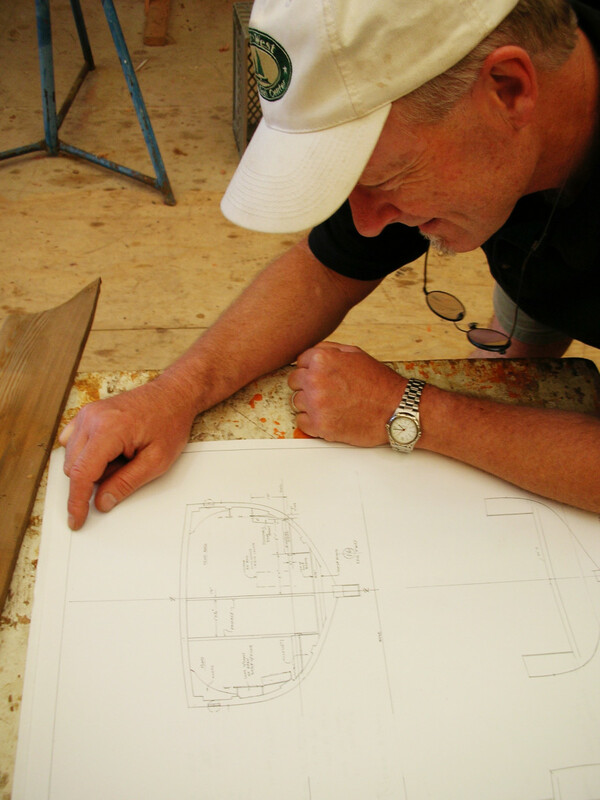 While Carl began work on making my ideas fit into a beautiful and efficient hull, sizing the scantlings, working out myriad details, and drawing everything up, my simpler activities revolved around selecting and locating the materials, systems, and parts—as many of them recycled as practical—that would comprise an affordable and reliable green vessel for us. I had heard stories convincing me that motorsailers that were designed to be equally adept at sailing and motoring seldom performed well at either. With the pattern of winds we knew to be prevalent in the Inside Passage, I decided that we should aim for a 2/3 bias toward clean mechanical propulsion, with the sailing rig designed primarily for motorsailing and steadying, although fully capable of driving the boat when the winds were just right for sail alone. From our experience with Royal Scot and driving biodiesel vehicles over the years, we already understood the environmental, health, and machinery benefits of running on local, cleanly sourced, and essentially carbon-free biodiesel. We wanted to do everything we could to use as little of the hydrocarbon versus carbohydrate-derived fuel as possible, while motorsailing at hull speed through most conditions. The completed structure on the chalks. Carl knew that to achieve extraordinary efficiency, besides a truly full-displacement hull and modest weight, we would need a slower turning engine with a high-reduction gearbox and an extra-large propeller. Just 30 horsepower is theoretically required by design rules-of-thumb to move the boat at hull speed in most conditions, and Carl recommended a 45- to 50-horsepower diesel to provide 50-percent reserve power. Hydrodynamics and decades of trial and error drove the decision—unusual when you consider how much power manufacturers routinely put into boats now. Coincidently, around this time a friend offered to give me a relatively young 75-horsepower Volvo engine that required a rebuild. This option would have been less expensive, provided more than double the power, and—this is big—have had a significantly smaller initial carbon footprint than any new engine because of the embedded carbon and energy already invested to acquire the raw materials, manufacture, assemble, and ship a new engine versus this already built one. Renewing existing vessels rather than replacing them as they almost always do now is in fact one of major tenants of the work that NOAA has been doing, trying to demonstrate to decision-makers and lawmakers that it makes more environmental and economic sense to upgrade vessels and their machinery in the majority of cases. Although it was not an easy decision, after a lot of thought I turned down the Volvo offer, partly because of the unnecessary horsepower, but also due to its less efficient design, too-high rpm, and extra weight. Had it at least been the right size, I probably would have rebuilt and used it instead. During much of the later construction, the author spent nights in the soon-to-be pilothouse. Maintainability is one of the more poorly articulated tenants of sustainability. Making things last longer obviously saves on pollution and resources, usually including money. 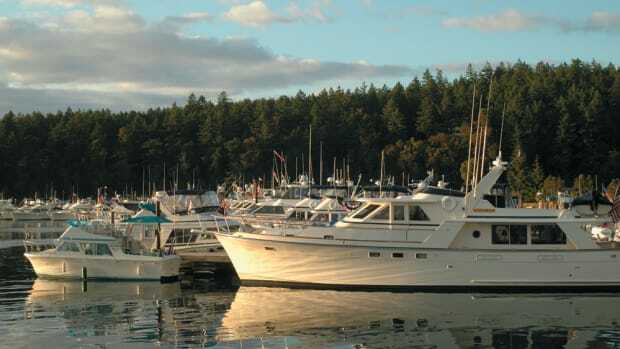 Easy access to parts and service in the northern waters is critical to this, so I selected an engine marinized by Klassen Marine, with three locations on the Inside Passage. Their best option for Ama Natura was a 2500-rpm, 48-horsepower, naturally-aspirated Mitsubishi diesel that has a service record of exceeding 20,000 working hours before needing a rebuild. I was able to marry this to a 3:1 ZF gearbox and a 24-inch feathering MaxProp from Italy. This has proven to be a great combination, giving Amaa lifetime fuel-mileage to date of about 0.7 gallons per hour, or 11 statute miles per gallon. 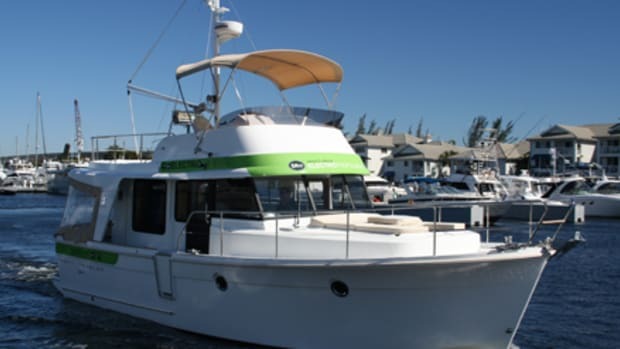 This is high for a commodious cruising vessel using current technology, especially one employing an alternative, very low-carbon, fuel source, such as B99.9 biodiesel. Yet, imagine two Tesla PowerwallTM battery packs running an AC induction electric motor and a 30-inch Torqeedo-like ultra-efficient prop that could easily push a cruiser through moderate tidal rapids at hull speed; potentially for days if enough walkable solar panels were squeezed onto the decks and pilothouse. Ama only has 125 watts of photovoltaic solar power right now, but perhaps solar electric will someday be Ama’s ultimate propulsion. Yet there might be an even better option. A great example of an ultra-clean small vessel is the hydrogen-fuel-cell-powered 6-year-old passenger ferry, Hydrogenesis, which we rode with its designer and owner in Bristol, England, last year. Hydrogen combustion emits only clean water, in a profound shift slightly cleaning whatever body of water in which the vessel operates. The moment of truth. Catch part 2 to learn more of Ama&apos;s finishing touches. Similar to what powers the new Toyota Mirai and Honda Clarity sedans, as well as the Hyundai Tucson SUV, Hydrogenesis’ hydrogen fuel cell supplied electric propulsion drives an AC electric motor. Hydrogenesis’ fuel comes free from a local factory that previously emitted hydrogen as part of its incidental wastes. Wind and solar can also be employed to make the fuel nearly carbon neutral. Hydrogenesis stores its H2 gas in a two-layer carbon fiber tank between steel bulkheads, while the new cars use triple carbon-layered tanks to be safe and light. With these factors in mind, we decided to employ similar measures into Ama to ensure as small an environmental footprint as possible during the construction process and during her cruising life. Local Oregon white oak was used for her frames and the planking is non-endangered dark red meranti (DRM), which is an affordable Southeast Asian mahogany. All of this is held together by silicone bronze fastenings in order to boost the durability and maintainability of the hull and framing. 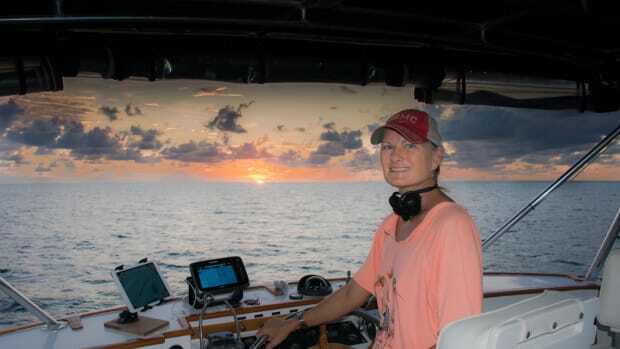 Stay tuned for part 2, as Ama Natura moves from Capt. Wilcox’s design table and into the chilled waters of the Inside Passage. Ideas such as Ama don’t materialize from thin air as Wilcox explains the indirect hand that NOAA’s research had in his search for the ideal green cruiser. Finally, Wilcox looks ahead to the cruising life of his dreamboat in the April 2016 issue of PassageMaker.